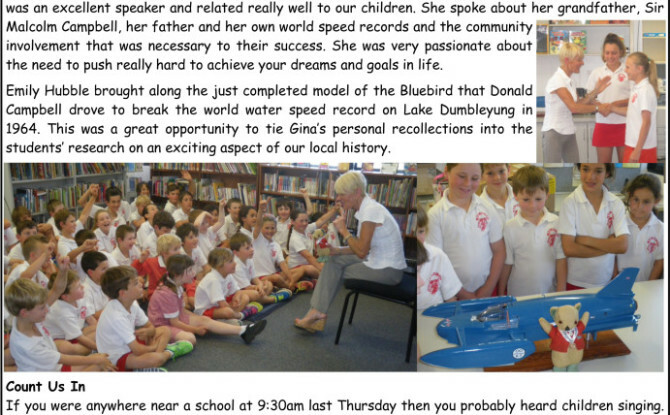 On Wednesday 5 November Gina Campbell and Mr Whoppit visited Dumbleyung Primary School and Kukerin Primary School. There were lots of questions from the kids and motivation from Gina. My dad got me up at 5.00am one morning to see Bluebird run between Crawley and the old brewery. Glassy water with a slight breeze but couldn’t quite get it up to full speed. Still worth the look though. – Peter Kelsall on a Lost Perth Facebook post showing photos of the Bluebird. I saw [Bluebird] there too. I am thinking it may have been the Ampol Service Station in front of Ampol’s offices in a lovely old house (Strawberry Hill or Farm). Later I worked there. – Lyn Hosking on a Lost Perth Facebook post showing photos of the Bluebird. I remember seeing [Bluebird] parked at a service station close to where the RAAF Association Spitfire used to be in Adelaide Terrace. I would have been only 8 but I recall it as clear as a bell. – Gordon Branch on a Lost Perth Facebook post showing photos of the Bluebird.